This is the first in our New Series - THE TRANSFORMATION. 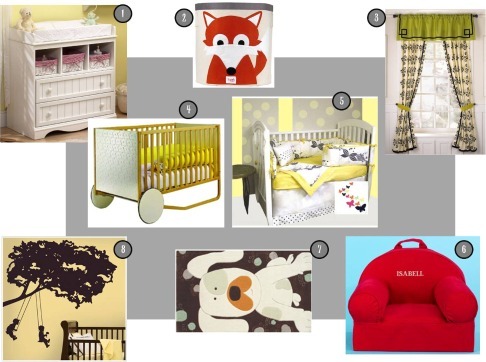 In this series we will create two inspiration boards to show you how the same color scheme or bedroom theme can be used to create a room for a small child as well as an older one. For the very first article in this series, we have chosen the popular grey wall as our base. Keeping the color of the walls a neutral yet very elegant grey allows the rest of the colors in the room to pop. We hope you enjoy these put together room decorating ideas and find the inspiration for your own creation. The nursery might be the last place you would expect to find grey walls, and yet, we have seen an increasing number of room colors grey nursery walls. The fun as you can see comes with the colorful array of bedroom accessories. The Changing Table - Andover Changing Table has a lovely design; lots of storage space; easy access to all baby's needs...and you can color it in any of the matching colors around the room. Organic Storage Bin in Orange Fox from 3 Sprouts is super cute and has other animals available too. The Harlow Window drapes from Cocalo Couture adds elegance as well as more color to the room. Lola Crib has an interesting futuristic design that will go well with this modern setting. This Botanica 3-piece crib set gives a bright an cheerful welcome to the room. A personalized red Nod Chair brings a new color into the room. A great stimulus for a growing baby. My Buddy Rug is super cute and will provide baby unlimited fun time on the floor. We love the Kids on Swings Giant Wall Decal . The silhouette style allows the other colors around the room to glow and yet adds to the cheerful tone of the nursery. Grey walls are a perfect base to showcase a truly fashionable teen girls bedroom. We are especially in love with the wall art we found at AllPosters. They are the inspiration for the rest of the room colors - grey helps the other colors stand out. The Versailles Bin keeps the room organized while looking so very chic. Amazing Red Letter Pillows have a unique design and color combination. Our inspiration for this room came from these gorgeous wall art. 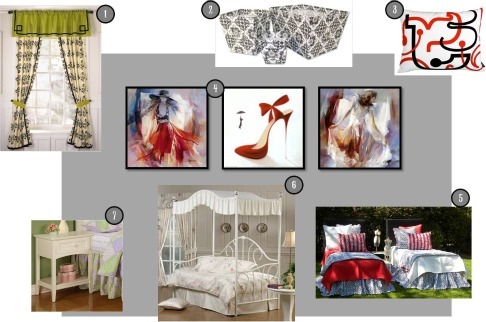 Find these and many more Fashion Posters and choose the look of your room. Femme Fashion Red and Animal Prints Bedding. The name speaks for itself. With so much color around in the beddding, wall art etc., the furniture can be a neutral white. Such as this Bristol Canopy Daybed . In the same vein, this Parker One Drawer Nightstand in an elegant white will offset the other colors around the room. We hope you enjoy this new series of room decorating ideas on Transformation. Here we took the same room colors grey walls and popped some brighter colors around the room to create both a nursery as well as a teen room.